Take a break from traditional burgers. 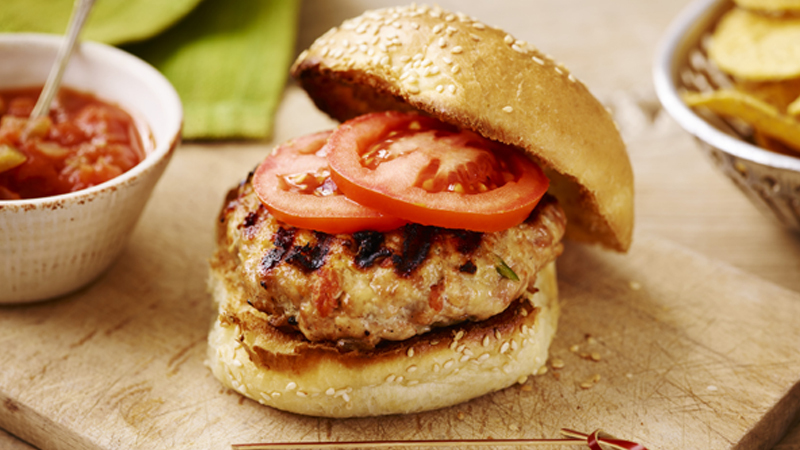 Lots of spicy chilli, cheese and salsa mixed with turkey breast mince for burgers to serve to a crowd. 1. Preheat a bbq or grill to medium-high heat. Mix the turkey, chillies, cheese and pepper in a large bowl with the salsa until combined. Shape the mixture into 12 patties. 2. Brush the patties with oil then place onto the bbq or under the grill and cook for 12-15 minutes, turning once, until cooked through and charred. 3. Serve the burgers on the buns with tomato slices and extra salsa. • Cooking burgers over medium heat ensures juicy, well-cooked burgers; cooking them over high heat will cause burgers to shrink. • If you want a little less heat use standard chillies instead of jalapeño chillies.